Nice pool. Friendly greeting. Mattress was great. Room a little dated, or refresh decor. Where to find Oshkosh hotels near an airport? 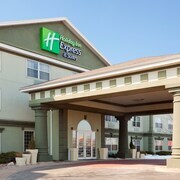 Where can I find hotels in Oshkosh that are near tourist attractions? Oshkosh is home to a good selection of quality accommodations. Oshkosh offers about 12 hotels and apartments within a short drive of the heart of town. Visitors hoping to find Expedia-listed hotels and accommodations close to the heart of Oshkosh, can choose from the Brayton Bed and Breakfast and Best Western Premier Waterfront Hotel & Convention Center. Cheap and cheerful hotel options in the Oshkosh area include the AmericInn Lodge & Suites Oshkosh, Motel 6 Oshkosh and Cobblestone Inn & Suites Oshkosh. 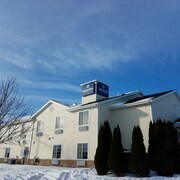 The Quality Inn is positioned 30 kilometres (17 miles) from the middle of Oshkosh. 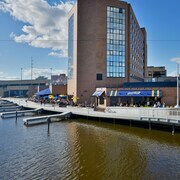 Alternatively, the Riverwalk Hotel Downtown Neenah is 19 kilometres (12 miles) away. More hotel and apartment options around this area include the Residence Inn by Marriott Appleton and the Holiday Inn Express Hotel & Suites Oshkosh. Once you have spent time in Oshkosh, take the time to investigate Northeast Wisconsin's other scenic and cultural delights. Northeast Wisconsin is known for forests and lakes. Popular Northeast Wisconsin tourist sites are lighthouses and open-air markets. Adventurous travelers can also try snowboarding in this part of United States of America. 45 kilometres (29 miles) away from Oshkosh you will find New London, where you can find Shamrock Heights Golf and Supper Club and Hatten Park. 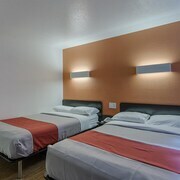 The Americinn New London and Americas Best Value Inn New London are some of the great long and short-stay options in New London. Or, you could stay in Kaukauna, 35 kilometres (23 miles) to the northeast of Oshkosh, where you can choose from the Country Inn & Suites By Carlson, Appleton North, WI and Days Inn And Suites Kaukauna WI. The Thousand Island State Conservancy Area and Charles A. Grignon Mansion are some of the most popular places to check out when visiting Kaukauna. If sport is what you love, be sure to take a trip to Lambeau Field, which is 65 kilometres (41 miles) to the northeast of Oshkosh. Sports fans wanting to sleep close to the stadium can take their choice from the Holiday Inn & Suites Green Bay Stadium or the SpringHill Suites Green Bay. If you are traveling into or out of Outagamie County Regional Airport and plan to stay nearby try Holiday Inn Appleton or Candlewood Suites Appleton. What are the most popular Oshkosh hotels? Great for EAA Rental! Less Than 3.5 Miles From EAA Grounds! Are there hotels in other cities near Oshkosh? 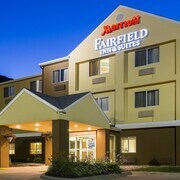 What other types of accommodations are available in Oshkosh? Explore Oshkosh with Expedia.ca’s Travel Guides to find the best flights, cars, holiday packages and more!